Fred Pearce has been writing about climate change for eighteen years, and the more he learns, the worse things look. Where once scientists were concerned about gradual climate change, now more and more of them fear we will soon be dealing with abrupt change resulting from triggering hidden tipping points. Even President Bush's top climate modeler, Jim Hansen, warned in 2005 that "we are on the precipice of climate system tipping points beyond which there is no redemption." As Pearce began working on this book, normally cautious scientists beat a path to his door to tell him about their fears and their latest findings. With Speed and Violence tells the stories of these scientists and their work-from the implications of melting permafrost in Siberia and the huge river systems of meltwater beneath the icecaps of Greenland and Antarctica to the effects of the "ocean conveyor" and a rare molecule that runs virtually the entire cleanup system for the planet. Above all, the scientists told him what they're now learning about the speed and violence of past natural climate change-and what it portends for our future. 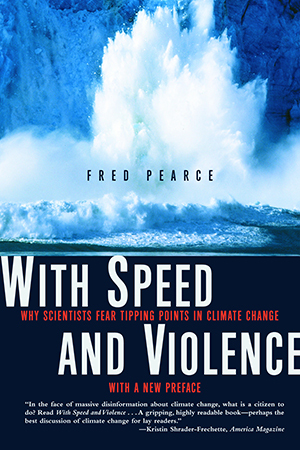 With Speed and Violence is the most up-to-date and readable book yet about the growing evidence for global warming and the large climatic effects it may unleash. "Well-documented and terrifying review of the scientific evidence supporting claims that Earth teeters on the edge of a climatic precipice . . . Important reading for policymakers, climate-change skeptics and anyone planning a future beyond the next decade." "[Pearce's] grasp of [scientists'] work is exceptional. What's more, he has a talent for explaining science in terms understandable to the nonscientist . . . This enjoyable read was difficult to put down." "If you want to quickly get up to date on climate change and its consequences, I recommend With Speed and Violence. If you can read only one book on climate change, this is it."